Near here stood the home of Sergeant Major John Champe (1752–1798), Continental soldier. 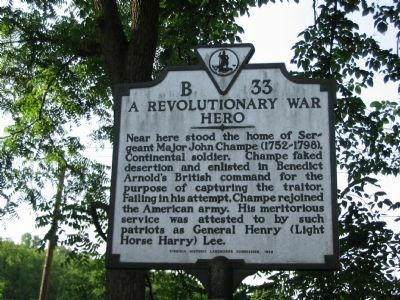 Champe faked desertion and enlisted in Benedict Arnold's British command for the purpose of capturing the traitor. Failing in his attempt, Champe rejoined the American army. His meritorious service was attested to by such patriots as General Henry (Light Horse Harry) Lee. Location. 38° 58.522′ N, 77° 40.032′ W. Marker is in Dover, Virginia, in Loudoun County. 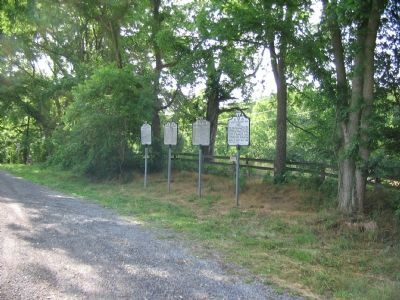 Marker is at the intersection of John Mosby Highway (U.S. 50) and Champe Ford Road (County Route 632), on the right when traveling east on John Mosby Highway. Touch for map. Marker is in this post office area: Leesburg VA 20177, United States of America. Touch for directions. (about 500 feet away, measured in a direct line); Battle of Aldie (approx. 0.7 miles away); Snickersville Turnpike (approx. one mile away); First Mass. Cavalry (approx. 1.2 miles away); a different marker also named Battle of Aldie (approx. 1.2 miles away). Touch for a list and map of all markers in Dover. More. Search the internet for A Revolutionary War Hero. Credits. This page was last revised on June 16, 2016. This page originally submitted on June 27, 2007, by Craig Swain of Leesburg, Virginia. This page has been viewed 1,921 times since then and 17 times this year. Photos: 1, 2. submitted on June 27, 2007, by Craig Swain of Leesburg, Virginia. • J. J. Prats was the editor who published this page.